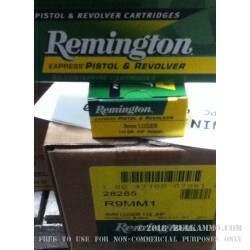 A case lot of high-quality Remington defensive 9mm Luger ammunition that numbers 500 rounds at a very good price point. This is a 9mm Luger 115 grain jacketed hollow point that is easily applicable to any defensive shooting or personal protection situation. This may not be considered as one of the ultra-premium defensive loads on the market, but it certainly has the chops to be used as a sufficient load for that very purpose. The price point doesn’t necessarily dictate the capability of a specific load. This cartridge proves that. The 1155 feet per second velocity and 341 ft. lbs. of energy that this cartridge delivers at the bore, show that it is a great potential threat stopper. Boxer primed brass and impeccable production processes, tolerances and finish, makes these rounds perfect for the reloader. 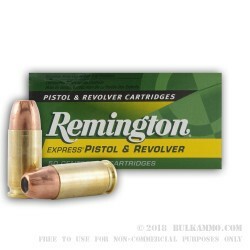 Furthermore, the price point makes these rounds easily justified as range rounds even though they are best suited to defensive shooting needs. The proven reliability of the Remington factory loads ensures you have the type of reliability and consistency that is necessary to have faith and trust in your choice for your defensive firearm. 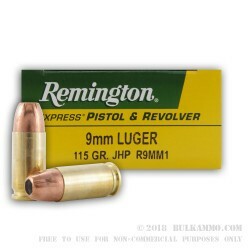 Substantial penetration for the lighter 115 grain bullet helps to make the case for this load as a good personal protection choice, especially given the decent recoil profile associated with the ignition of the load.